First of all we would like to thanks Ladies Club SG Beauty Blog in Singapore for allowing us to share this wonderful beauty and skin care tips. If you love to have a beautiful skin by using natural skin care recipes, you should read this great tips below. They say beauty is not skin deep, but who wouldn’t want to look fantastic on the inside as well as on the outside? For ages, people have been spending tons of money on high-end synthetic products that have been lauded to maintain beauty by moisturising the skin, enhancing complexion, reducing wrinkles and lines etc., but what if you could do all this naturally, for much less money and with better results? Is Beautiful Skin Really Possible With Natural Skin Care Recipes? Yes, it is. These days, a lot of people are trying to replace synthetic or processed products with organic ones, believing it to be much healthier. Make-up and skin care are not any different. A great deal of attention is now surrounding the idea of caring for the skin naturally using natural organic ingredients. Everyone wants that healthy, glowy and radiant skin, and in the past, only a few people achieve it naturally. The good news is that it doesn’t have to be done using expensive products, nor do you have to seek out over-priced specialists or consultants. You can do it at home using natural ingredients with natural skin care recipes that have been proven to work. Although some products claim to be natural, they really aren’t. You ought to check the labels yourself to see what ingredients are included in the product. Some products may have toxic chemicals even though their labels say all-natural or 100% natural. Avoid off-the-shelf products that have fragrance, as it is often synthetic. This is one of the best ways to ensure that you are using something that is all-natural because you are the one who put together and mixed the ingredients! You may actually be surprised by the simplicity of this process. Here are some natural skin care recipes that have been tested and proven effective for all types and tones of skin. Some of these recipes have exact proportions while others are estimates. You can always manipulate proportions to get the consistency, scent or concentration that you prefer. You may even substitute ingredients that have a similar effect, especially if you have an allergy to an ingredient used. At the end of the day, these recipes are guidelines and you can fine-tune them to a ratio that works even better for your skin type. Almond oil or castor oil. Directions: Blend, then rub a little oil on your face and massage it into your skin for a few minutes. Once you’re done, use a warm wash cloth to wipe your face until it is no longer greasy. Directions: Combine honey and yoghurt in equal proportions to make a paste that you can apply to your face. Leave the mask on for a few minutes and then wash off properly. Directions: Combine equal amounts of sugar (white or brown) and almond or olive oil. Rub the mixture on your skin and massage for several minutes. After you are done, wash off your skin with warm water. Directions: Combine all three ingredients to make a cream. Apply the cream to your skin and rinse off with warm water after an hour. Directions: Combine all ingredients to make a paste then apply it to the blemish. Leave it on for 10 minutes, then wash it off with warm water. Directions: Crush the leaves and put them in the boiling water. Strain the mixture once it has cooled and use it as a spray for your skin. Directions: Heat the beeswax, cocoa butter and coconut oil stirring occasionally until they are blended properly. When this mixture cools, add the remaining ingredients and mix them with a mixer until the mixture is fluffy. Put the mixture in an airtight container for storage. 10 drops of essential oils (optional, for scent). Directions: Melt the shea butter and coconut oil and add the remaining ingredients. Once the mixture is cooled, you can pour it into your desired container. (Do not cool the mixture until it becomes completely solid unless it is in the container that you will use to store. It should still be runny enough so it can be poured.). 9. 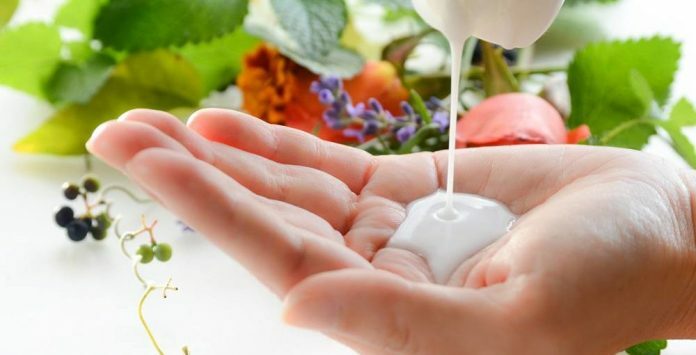 Natural skin lotion (not greasy). 5-10 drops of essential oils (optional, for scent). Directions: Melt the beeswax and oil and then add it drop by drop to the water with the essential oils. Keep stirring until the blending is done. The mixture should be creamy but not greasy. Now that you have a wide variety of natural skin care recipes, go ahead and enjoy making them and tweaking the recipes according to your needs to a healthier and more radiant skin.